This weekend saw the live debut of Thom Yorke's new side-project - an as-yet-unnamed band featuring long-time Radiohead/Yorke producer Nigel Godrich, former REM/Beck sticksman Joey Waronker, multi-instrumentalist Mauro Refosco and, bizarrely, RHCP's Flea. In addition to the two shows originally planned at Echoplex, Los Angeles on the 4th - 5th October, Yorke and co also played two warm-up shows on the 2nd and 3rd. 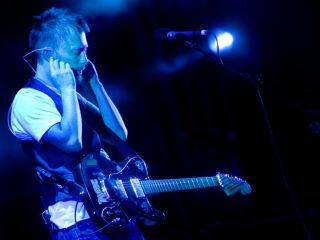 Speculation last week (sparked by Yorke's announcement of the shows on Dead Air Space) centred on whether the group would play original tunes or serve as a Thom Yorke backing band. We now know that the supergroup turned out to be more of the latter, playing through what seems an entirely Yorke-penned set. The shows are the first major live outings for the Radiohead frontman for some time, who has never toured his solo material and only played a handful of small gigs to support his 2006 debut The Eraser. The Eraser was played in full during the shows, followed by a solo Yorke encore featuring four completely new songs (it's not clear whether the songs are Yorke or Radiohead numbers). The band then returned to play more new tracks, among them recent Yorke double A-side 12-inch The Hollow Earth/These Are My Twisted Words. So, did it all come off? Well, despite Yorke's disclaimer that the shows would be "total chaos and […] kind of a rehearsal", the band were very together indeed - plus it's certainly very cool to see Thom playing sans Radiohead but still in a full band scenario. Check out YouTube footage of the show below, and head over to At Ease Web for a full write-up, setlist and even more YouTube.